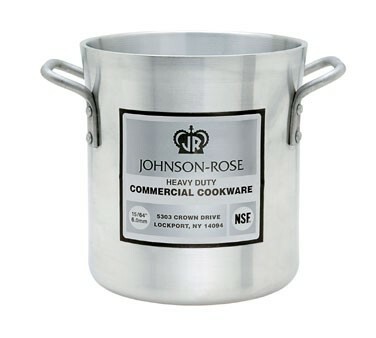 Johnson Rose 65720 Heavy Duty Stock Pot 20 Qt. TigerChef > Smallwares > Cookware > Aluminum Cookware >< Aluminum Stock Pots > Johnson Rose 65720 Heavy Duty Stock Pot 20 Qt. $45.44 Vollrath 67520 Wear-Ever Classic Aluminum Stock Pot 20 Qt. $97.67 Vollrath 68620 Wear-Ever Classic Select Heavy-Duty Aluminum Stock Pot 20 Qt. $44.63 Winco AXHH-20 Super Aluminum Stock Pot 20 Qt. $342.64 Vollrath 68700 Wear-Ever Classic Select Heavy Duty Aluminum Stock Pot 120 Qt. $120.93 Winco ALHP-120 Precision Aluminum Stock Pot 120 Qt. $601.58 Vollrath 68701 Wear-Ever Classic Select Heavy Duty Aluminum Stock Pot with Faucet 120 Qt. $25.95 Winco AXS-20 Super Aluminum Stock Pot 20 Qt. $113.99 Thunder Group ALSKSP012 Aluminum Stock Pot 120 Qt. $304.99 Thunder Group ALSKSP015 Aluminum Stock Pot 200 Qt. $45.99 Thunder Group ALSKSP604 Aluminum Stock Pot 20 Qt. $30.99 Royal ROY RSPT 20 M Medium Weight Aluminum Stock Pot 20 Qt. $55.99 Royal ROY RSPT 20 H Heavy Weight Aluminum Stock Pot 20 Qt. $119.99 Royal ROY RSPT 120 M Medium Weight Aluminum Stock Pot 120 Qt. $69.99 Crestware DBL20 Heavy Weight Aluminum Double Boiler Stock Pot 20 Qt. $39.99 Crestware HPOT20 Heavy Duty Stock Pot 20 Qt.